OK, so the due date has come and gone, and the dates for the transfer to take place are practically upon us. What are the next steps? Do we have to actually do anything? When was the third and final transfer announced on the in-game portal? I've been playing consistently on NA for the last few months, and there has not been any in-game portal announcement of this latest and final round of transfers. When the server East/West server merge happened (in August I think? ), there was a note about transfers in the FAQ, fair enough - I didn't apply then because of the undersea cabling shenanigans with SEA. When the Aus servers were announced, I did get that email - but it made no mention of transfers (I've just reopened it to make sure). I did install the client to see what the population and ping were like, figuring there would be an official (i.e. in-game, like the survey mentioned below, and official website) notice about upcoming transfers afterward. IIRC, somewhere between those two events there was also an in-game survey asking whether one would transfer - but it didn't imply commitment to a process or provide instructions to follow-up (a survey is obviously not the same thing as an application, etc.). Is it the case that only people who answers 'yes' instead of 'maybe' were contacted with instructions? Anyway, my only two sources of news are the main site, launcher/in-game portal. I just checked the main site's news pages for the last two months and don't see anything - please link to correct me if I'm wrong - and yeah, I have definitely not seen anything about the third and final round of transfers come up in-game. I only happened to come across this today because I came to the forum looking for other information. If you're wanting to transfer (even though the time has passed), I'd recommend getting onto Jake right away at j_truman@wargaming.net. He's been very responsive to my queries, and if it's still possible to sneak in he'll probably be able to help. Thanks for that info - I appreciate the thought, but happy to accept that I've missed the boat. I'd want to investigate queue times at the tiers I play at rather than just jumping across on the spur of the moment. I was more seeking clarification on the statements about how easily we should have seen this news, as it doesn't correspond with my experience at all, that's all. I imagine that my use case / 'user story' is probably one of the most common ones: a player that just sees whatever news is on the launcher when they run it to play (i.e. potentially missing posts if they haven't played for a week or whatever), sees whatever pops up in the game itself (i.e. the actual product! lol), gets emails (though there's the risk these get marked as spam), and may occasionally browse to the main website. Given the above, the only way to make sure you reach everyone that needs to be reached is by sending an email to the address registered to the account (there was no email about transfers), having something on the main page (not that I can find**), and/or having something in-game (nope). The closest WG came to any of that is the in-game survey back in August(?) - but that neither provided info on how to proceed, nor did it mention any specific round of transfers (let alone the 'third and final' one, etc.). That leaves the forum and social media, and the idea that the players should mostly be reached with important news through the forum or social media is quite poor form. It was simply not communicated properly through the product itself. **note the email response that another player got from Support, clearly stating that news about transfers would be posted on the main page, which definitely wasn't done (reply with a link if I'm wrong of course). Why would they care if the players are to lazy to check into forums, Hell most of them cant find the basic package in Prem shop and get on here to cry that a Prem tank is 75 bucks when right below that package is one for 35 bucks. Sheep are herded people shouldn't have to be. I already have an account on the SEA server. I know I can't merge them, but what will happen to it when my NA account moves over. They are under the same email address. Why are transfers only a limited time offer? That's just poor business practice. Why not allow people to pay a fee to transfer, such as other market dominating MMO's? The NA server is dying and people will continue to need options if they want to play this game. So the actual transfer window is open today, as this part of the process is being conducted by the NA team, so this step is being actioned under NA time. As I have mentioned previously in this thread, messaging for the third transfer was communicated across NA and SEA forums, as well as social media, emails and the in-game portal. 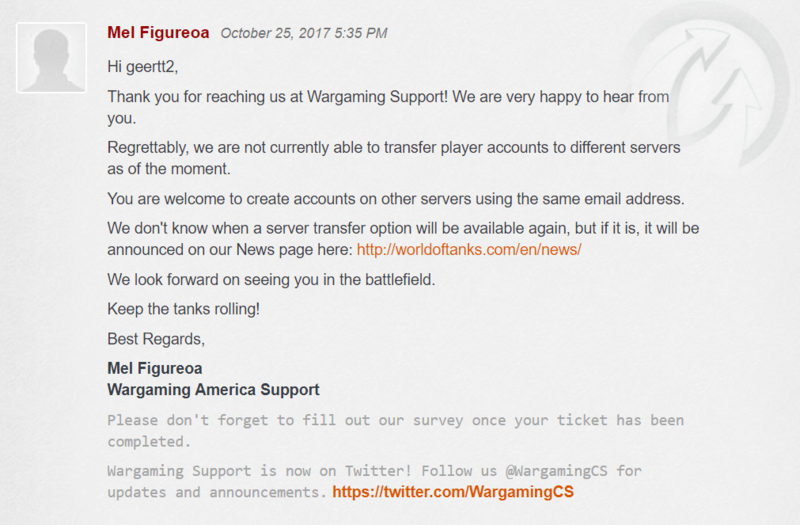 We acknowledge that this wouldn't have been able to reach everyone but as this was relativity small on the scale of announcements across Wargaming's portfolio unfortunately we couldn't get it as far as the home page of wargaming.net, however I've personally made note of this feedback and others who have expressed similar concerns and we'll look to extend our voice further in future instances. Please send me an email to the address shared throughout this thread and we'll do what we can to change the email address of one of your accounts in time to transfer. Given the nature of how our player's data is stored it is currently not possible to offer inter-server transfers on a permanent basis. However, this is something we're working to improve in the near future. Edited by Xxdestroyer, Nov 28 2017 - 03:45. Thanks for letting us know, we'll see what we can do. What is this 'complete your transfer' password stuff about? I put my name on the google docs to specify interest. Has an email been sent out already? I haven't received any further notifications. In the same boat here. Filled in the google form and heard jack since. Really hope they did not screw this up as I do want so badly to get to SEA server.  Edited by Ironhead_01, Nov 28 2017 - 07:50.
thanks It worked! Their transfer confirmation email incorrectly asks for your "username", it should ask for your "email" so I tried using my email with the password they gave me and it worked! Transfer to SEA accepted! will be done in 3 hours from now. I CAN'T BELIEVE THEY SCREWED UP AGAIN. I've sent you a PM that might help. Well the wait is finally over. I am now officialy on SEA. TY to all who assisted. Happy tanking all.